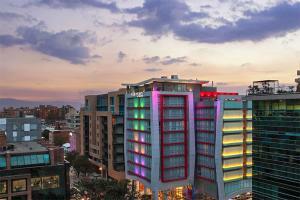 Discover the unique atmosphere of the Four Points by Sheraton Bogota Hotel with its unbeatable location near art galleries, nightlife, shopping, restaurants, and international fashion boutiques. The 124 rooms and suites are equipped with the latest features and technology, with modern and contemporary décor. Take in the breathtaking views from your room before enjoying a fresh breakfast buffet. After a day of exploration, unwind in the executive lounge and savor the cuisine at Cook's Restaurant. El Dorado International Airport Bogota is 7 miles from the hotel, and Bolivar Square is 6 miles away. El Chico Museum, World Trade Center, Royal Center, Atlantis Shopping Mall, Zona T, Bolivar Square.